Correfocs originate from a form of medieval street theatre called ‘Ball de Diables’, representing the fight of good against evil. The Correfocs themselves are not medieval. Spanish dictator Franco banned many aspects of Catalan culture, so after his death, Barcelona wanted to fill the streets once again with fire and festivity. Meaning “fire runs”, the Correfoc makes sure that any festival goes with a bang! Dressed in red and black, wearing horns and masks, ‘colles de diables’ (groups of ‘devils’) dance amongst the crowds accompanied by loud music, waving sparklers, firecrackers, and roman candles, spitting fire into the crowd. Great atmosphere, great fun but can be very frightening for small children, animals and the less adventurous adult. 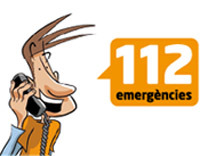 A predominantly Spanish tradition, this Catalan firefest of fireworks and bangers has fizzled out in North Catalonia since an enquiry into injuries caused by the fireworks at the Millas féria in 2008 which led to legal proceedings. A 55 year old man was injured by a piece of metal from one of the explosions and had to be hospitalised. The «distances réglementaires de sécurité n’auraient pas été respectées » as there should be at least 8 meters between the show and the public. 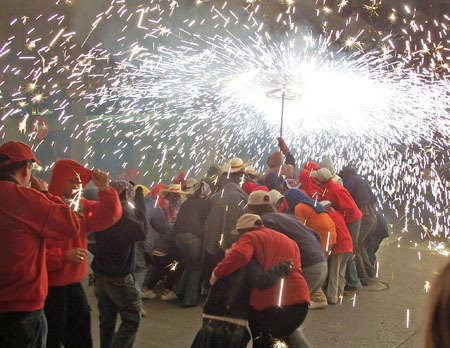 The Spanish tradition, from whence the correfoc originates, is that the fireworks weave in and out of the crowd, which does not conform with French law. Amongst other useful advice during a correfoc, the Generalitat de Catalunya suggests……..
Correfoc: Streets of Fire, Dancing with the Devil. Cafe del Mar Blog! Ironically, as Britain continues to measure distance in miles and the rest of Europe in kilometres, it seems that the word ‘mile’ comes from the French, mille (thousand) so named because the Roman mile was equal to one thousand double paces (one step with each foot).